Since 2003, Russians have been throwing back shots of Putinka vodka, a popular brand honouring the country’s favourite president-prime minister-president. Now, according to Russian media reports, they may be able to start paying homage to yet another political leader: Muammer Gaddafi. As Kommersant FM and the online news site Marker.ru report on Wednesday, the company behind Putinka has set its sights on a new brand and registered the trademark for a liquor called Commendatore Muammer. If true, it is needless to say a bold move. 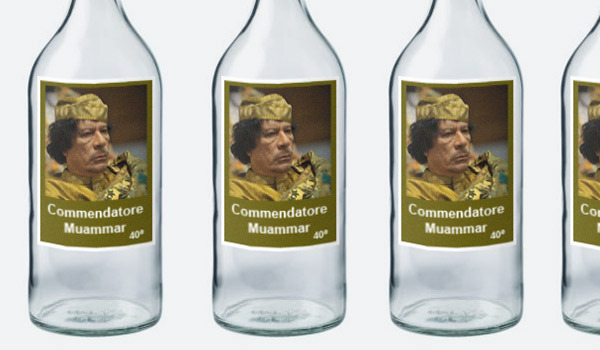 While vodka drinkers have gone crazy for the just-bearable taste and affordable price of Putinka, one of the best-selling vodka brands in the country, they are likely to be less keen on a Gaddafi product, even if Putin did liken the UN resolution ahead of NATO’s Libya air strikes to “medieval calls for crusades”.